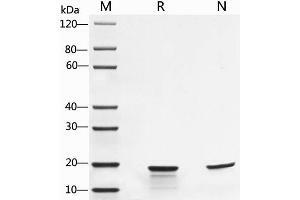 2 μg of IL-1β, Mouse was resolved with SDS-PAGE under reducing (R) and non-reducing (N) conditions and visualized by Coomassie Blue staining. IL-1β, Mouse stimulates cell proliferation of D10S cells. The ED50 for this effect is 0.81 pg/mL. Background IL-1 is a name that designates two proteins, IL-1alpha and IL-1beta, that are the products of distinct genes, but recognize the same cell surface receptors. IL-1alpha and IL-1beta are structurally related polypeptides that show approximately 25% homology at the amino acid level. Both proteins are produced by a wide variety of cells in response to stimuli such as those produced by inflammatory agents, infections, or microbial endotoxins. The proteins are synthesized as 31 kDa precursors that are subsequently cleaved into proteins with molecular weights of approximately 17.5 kDa. The specific protease responsible for the processing of IL-1beta, designated interleukin 1beta-converting enzyme (ICE), has been described. Mature human and mouse IL-1beta share approximately 75% amino acid sequence identity and human IL-1beta has been found to be active on murine cell lines. 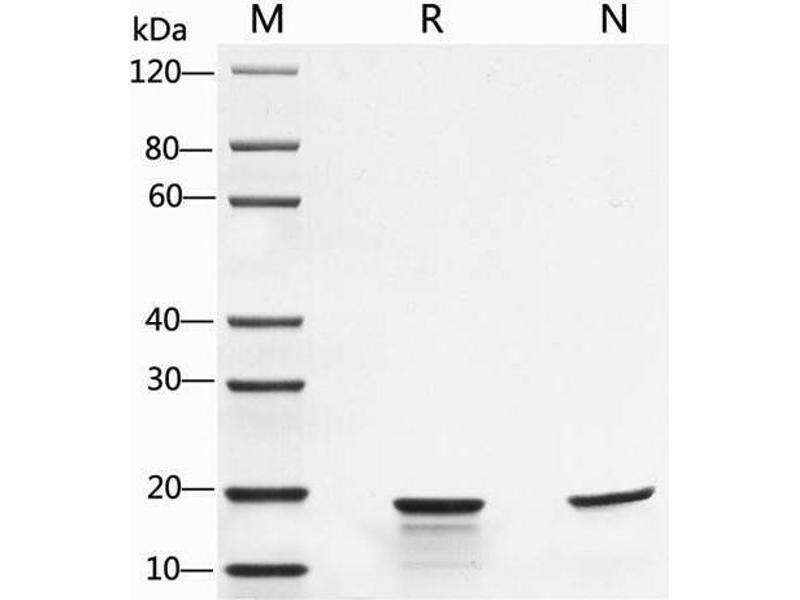 GenScript Interleukin (IL)-1beta, mouse, produced in E. coli, is a non-glycosylated polypeptide chain containing 152 amino acids and having a molecular mass of 17,400 Da. 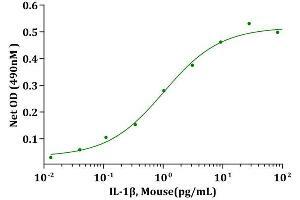 Synonym: Interleukin (IL)-1beta, mouse. Formulation: The protein was lyophilized after extensive dialysis against 50mM Tris-HCl, pH8.0, 50mM NaCl buffer. Reconstitution It is recommended that the lyophilized rmIL-1beta be reconstituted in sterile 18 Mohm-cm H2O not less than 100 µg/ml, which can then be further diluted to other aqueous solutions. 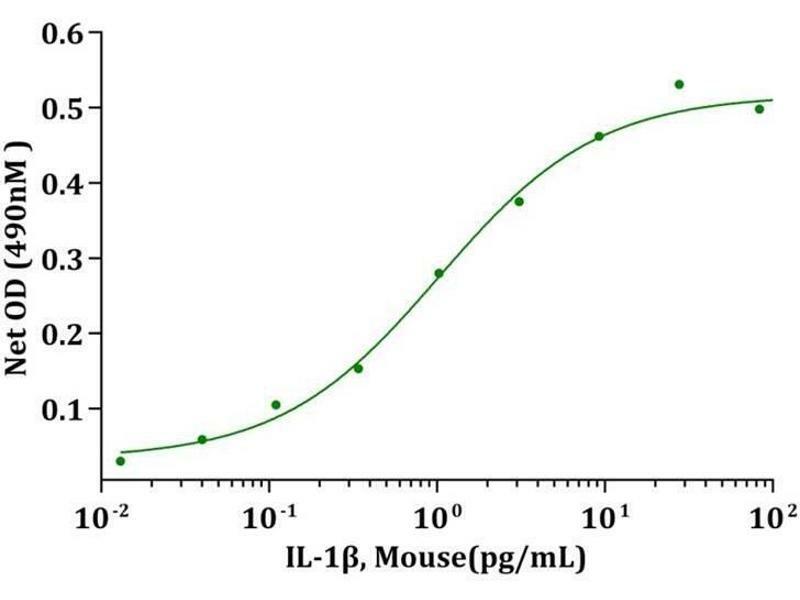 Specificity The ED50, as determined by the dose-dependant stimulation of mouse D10S cells, has been found to be less than 0.01 ng/ml, corresponding to a specific activity of 1.0×108 IU/mg. Product cited in: Zhang, Bennett, Verkman: "Ex vivo spinal cord slice model of neuromyelitis optica reveals novel immunopathogenic mechanisms." in: Annals of neurology, Vol. 70, Issue 6, pp. 943-54, 2011 (PubMed).